He never sleeps. He doesn’t eat or drink so much as a glass of water. He is a machine for killing who can defend himself with anything from a pen top to a rolled up copy of the New York Times colour supplement. He can drive a car off a roof and emerge with nothing more than a slight limp, hurrying off without a backward glance at the brilliantly shot mayhem he leaves behind. From India to Italy, London to Paris, Madrid to Tangiers, he criss-crosses the globe with nothing more than a donkey jacket, a hard face, and an endless supply of passports and currency. He is the anti-James Bond – he couldn’t care less if it’s shaken or stirred – he’s going to throw it in your face and escape anyway. 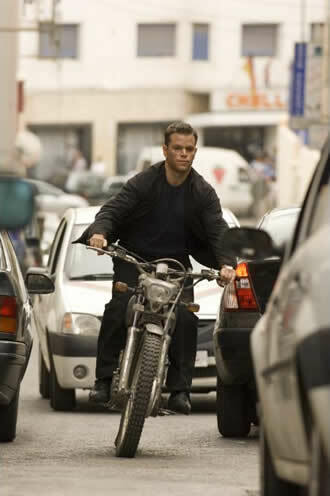 He is Jason Bourne – or rather, he isn’t as we discover in this the final (or perhaps not…) film of the trilogy. Bourne, we know already from movies 1 and 2, is what he was made by a shady branch of the CIA which created him from the broken shell of a good man. Bursting through his conscience-stricken amnesia come the memories of his past. And now the implacable Bourne is coming home to destroy the evil set-up that created him. And it turns out to be even more evil than in the previous films. The successor project to Treadstone is a new set-up that kills American citizens who get in its way; seizes citizens off the streets and uses “extraordinary rendition” to make them disappear, and even picks off nice liberal journalists in Waterloo station of all places. The film is so brilliantly shot and tense that you forget it is absolute nonsense. Far from being able to track citizens across the globe through a seamless network of CCTV cameras, phone taps and satellites that set off alarms when key words are spoken – “Bush and Blair are the real terrorists” and that sort of thing – the real CIA are a hopelessly disorganised and leaderless bunch. Information about two of the September 11 bombers crossed the desks of no fewer than 60 agents – and none of them heard any alarm bells! The bit about being ruthless in trying to cover up its own crimes is of course absolutely spot on. But Bourne is able to destroy their plans, with just a little help from the few people left inside the agency who object to what’s going on. Bourne movies are, I admit, not exactly made to trouble the mind – but this new film does have a real go at the secret state and the politicians that rely on it. Matt Damon is a really engaging actor and the non-stop action drowns out the sceptical little quibbles about the plot – those “why on earth did he do that” moments.